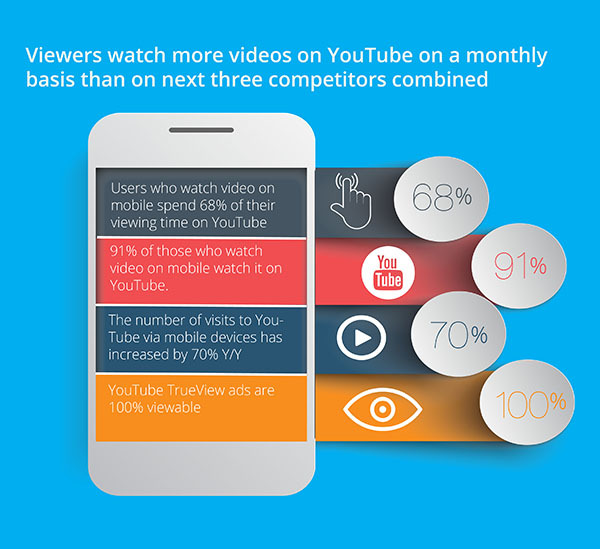 Consumers want more video! This data is understood to almost every advertiser on these days. Therefore, we see and will continue to see more video advertising. This video published by ViralGains describes some trends to watch in the video advertising field, in 2015. As an example, 1 in 9 adults watches video every single day. The best hours to advertise is evening, after work. The best place to reach people is the home of the viewers. In fact, the spread of tablets and smartphones makes the videos more visible out of home – and this is a great opportunity for advertisers. An interesting infographic made by Radiate Media shows what is the value of social presence (which includes social media advertising). 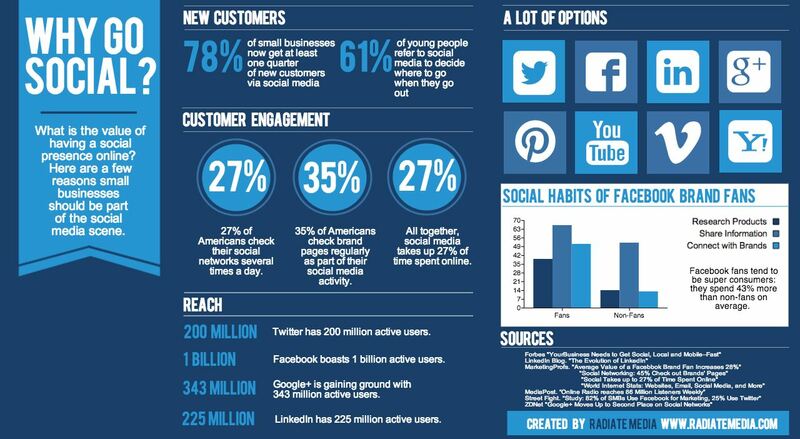 According to the infographic, 78% of small businesses get at least 25% of new customers via social media. With 1 Billion Facebook users, 200 Million Twitter users and hundreds of Million users of other social media websites, you can reach large and targeted audiences quickly. Youtube has become a major part of our internet expericne. As every smartphone user knows, the most popular video website is available on mobile devices and therefore it has a great popularity. According to the data brought by Sightly Enterprises, it is recommended to combine youtube advertising in your advertising strategy. This great video created by Hoppin Online Marketing, shows the digital marketing trends of 2015 – among them is the vast use of smartphones. In one week, 81% of us usually use the internet through our smartphones, 77% of us use search engines, 48% of us watch videos and 63% connect with their friends. The important point for us in Webmedia-WMADV, is that 79% of the smartphones holders use them in their shopping to compare prices, get cupons, read comments, etc. If they see an ad, they tend to click on it and often buy products. 82% of us see mobile ads, and 42% of us click on it! Almost in every one of these activities, the consumers may experience mobile ads directed to them – In WMADV-Webmedia, we believe in each one of these fields. According to the infographic of Ecommerce Platforms, the retail sales in the U.S. will grow in rate of 10% per year, and also on 2015. Altought this data, the online sales are a small part of the whole retail market. In 2014 it held 8% of the shares, and this year it holds 9-11% of the shares in the market. How Much Time Do We Spend on Mobile Every Day? This interesting infographic by Wolfgang Jaegel shows how much the mobile phone has become a central part of our lives. For example, average time spent on mobile per day is 2:21 hours. Moreover, the mobile web is expected to dominate desktop use by 2015. Will 2015 Be a Good Year for Video Advertising? On recent years, we can hear a lot of forecasts about video advertising and its growing popularity. This video, made by ReelnReel, mentions some trends in video advertising that are going to happen on 2015. According to the video, the online video ad market is growing faster than many kinds of advertising: display, search and TV. Furthermore, it is estimated that native advertising will grow. 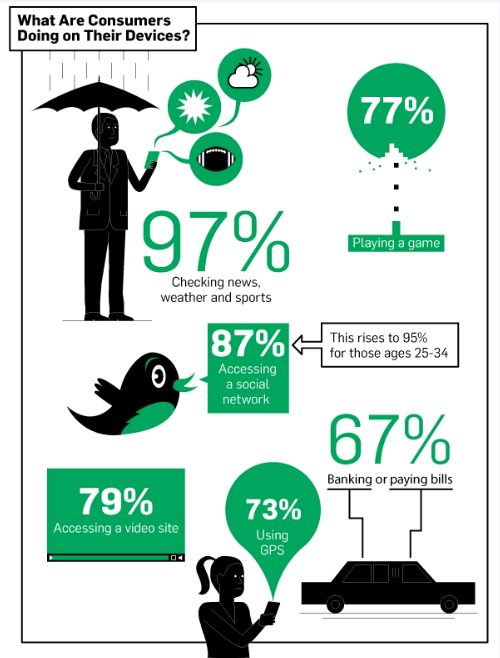 In this infographic created by Vouchercloud, there is a portrait of a mobile consumer and trends that will increase on next years. According to the forecasts, by 2018 it is estimated that m-commerce sales (commerce via mobile) will reach 626 billion dollars, almost equal to e-commerce. Another interesting data from this infographic is that 90% of the consumers use their smartphones in order to do pre-shopping activities. Some of them, of course, buy products. For more articles, video and infographics, click WMADV.